This is a general query that we receive often. However the best answer to this lies in your horoscope. Mercury is a dual natured planet and hence Emerald can be worn in silver as well in gold however which is the best metal that shall give optimum results depends on position of Mercury and its association and aspects with other planets in the birth chart. 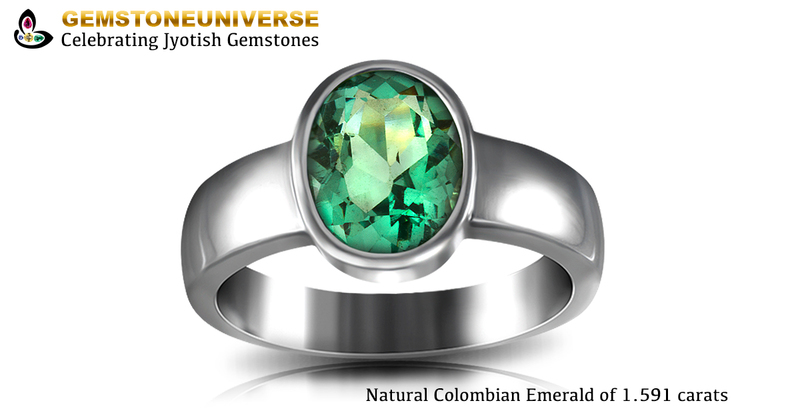 Mercury rules the signs of Gemini and Virgo in the zodiac and its gemstone is the Emerald. 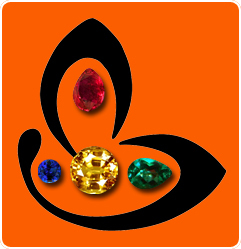 Fortifying the position of mercury by wearing a Jyotish Quality Emerald boosts immunity and gives considerable relief in skin ailments and also upper respiratory tract problems notably bronchitis. Featured today is a brilliantly clear natural emerald from Colombia. What is notable is that Emerald is almost always an included gemstone having Jardines and for a natural emerald to have this Emerald clarity is quite a rarity. Above 95% clarity, beautiful early summer grass green colour, exceptional cut that allows maximum lustre and play of light make it an exceptional gemstone that makes the cut as a Jyotish Gemstone and deliver results that only true Jyotish Gemstones are capable of . Do notice the price tag too. Where else would you find a Gemstone with similar features at this price? Do view the videos to assess all features and benefits. This ring goes to a long standing patron of Gemstoneuniverse who started her Gem therapy with Uparatnas and after getting benefits has graduated to precious gemstones.